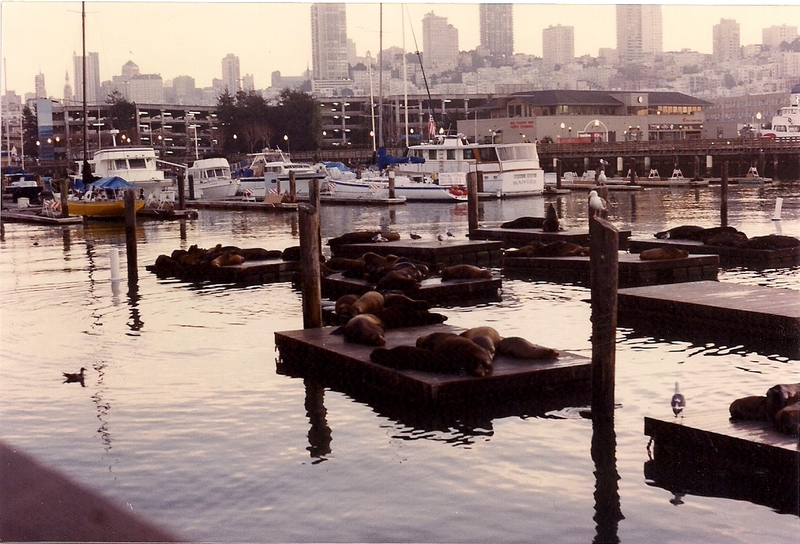 I really liked spending time along the wharf at Pier 39. I especially enjoyed seeing the sea loins. According to the wall boards posted along the wharf, these are young male sea loins. They come to rest during the winter months. The floating piers seemed a bit sparse this day, though I counted more than a hundred ... which at the time seemed a lot. 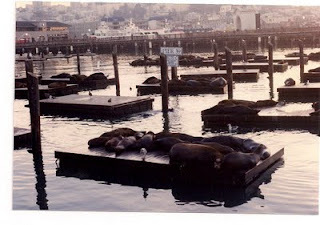 I would later learn ... the piers could sometimes be so overloaded there would be fighting for a spot to sleep. As I recall, since it was some years ago when I last visited, the weather was rather damp and gloomy that day. The city skyline is evidence of this fact. I'd come into the city this day with my co-driver. We'd been laid over with no likelihood of securing a load for another day or two. We' d taken the train from Hayward station across the bay and rode the trolley from State Street over the hill to the Embarcadero. We walked and walked ... along the piers and other wharfs, stopped into some shops on the Embarcadero and then walked to Chinatown for something to eat. I'd eat in one of the 'fishouses' on Pier 39 on another visit. I don't know what it costs today to take the train from Hayward into the city, ride the trolley, and have a meal either on Pier 39 or in Chinatown, but back then I could do the entire day for $20.00.